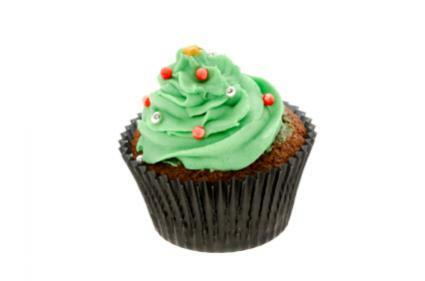 Making Christmas cupcakes is a great project for families with kids to do during the holidays. While a simple cupcake is fun for everyone, take your Christmas cupcakes to the next level by helping your kids decorate them in fun, holiday themes. This easy recipe makes a good base for your cupcake decorating. The cake rises evenly and is firm enough to hold whatever toppings you choose to put on it. Grease or line two cupcake pans and set aside. Beat the eggs into the butter mixture one at a time, making sure each one is well incorporated. Sift the cocoa, cinnamon, flour, baking powder, and salt together. Add a little of the butter mixture to the flour mixture, stirring well. Add a small amount of the buttermilk, then continue alternating the butter mixture and buttermilk until they have been completely incorporated into the flour mixture. Spoon the batter into the prepared cupcake tins until each cup is approximately 2/3 full. Bake at 375 degrees for 30 minutes, or until a toothpick inserted into the centers comes out clean. Allow the cupcakes to cool completely before decorating. You may refrigerate them overnight if desired. This is a very simple way to decorate your finished cupcakes. Use any type of white or buttercream frosting as the base. Make sure it's been chilled well for about an hour before piping. Beat the chilled frosting with a few drops of green food coloring until it reaches the desired color. Spoon the green frosting into a frosting bag. Pipe the frosting in a tall swirl on top of each cupcake. Decorate your "tree" with sprinkles, silver balls, sugar and stars to complete the design. These whimsical snowmen cupcakes are very simple to put together; if you are decorating with a mix of older and younger children, consider using an assembly line to put them together. Cover the top of each cupcake with a generous amount of white frosting. Press a marshmallow onto the center of each cupcake. Use the black gel frosting to give the snowman eyes and a mouth. Use the orange gel frosting to give the snowman a nose. Wrap a piece of licorice or sour chewy candy around the marshmallow's base as a scarf. 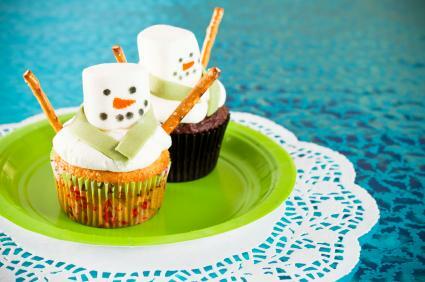 Stick two pretzel sticks into the sides of the cupcake as the snowman's arms. 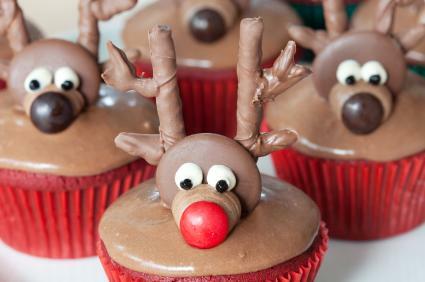 Make an assortment of reindeer cupcakes, varying their antlers and the color of their noses to create Rudolph and his friends. Spread a thin layer of chocolate frosting over the top of each cupcake. Place a Rollo or other chocolate candy on its end in the center of each cupcake. Spread a small amount of chocolate frosting onto the bottom front of each candy and press a red or green M & M into the frosting for a nose. Pipe a small amount of white frosting onto the candy for eyes and follow with a small amount of black gel frosting in the centers. Break apart the chocolate covered pretzels and use the pieces as antlers, pressing them into the back of the cupcake. This is a fun cupcake that kids will love to assemble and eat. An adult may be needed to help shape the different sections before they are applied to the cupcake. Add a generous amount of red food coloring to the royal icing until it resembles the color of Santa's coat. Spread a thin layer of the icing onto the tops of each cupcake. Set the cupcakes aside. Divide the fondant into three sections, with one section being twice as large as the other two. Use food coloring to turn the largest section red and one of the other two sections black. Roll the red fondant into cylinders about 1-inch long and 1/2-inch wide. Roll out the remaining, white fondant into a long tube and slice the tube into coins. Place a coin of white fondant on one end of the red cylinders. 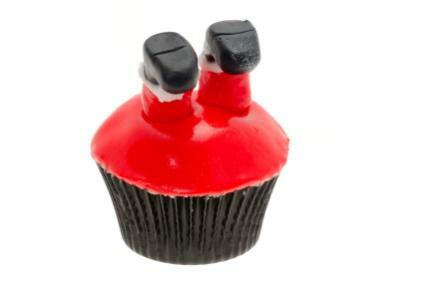 Mold the black fondant into the shape of two boots and press them onto the white coins on the ends of the red legs. Press the ends of the red legs into the red icing on the cupcakes. 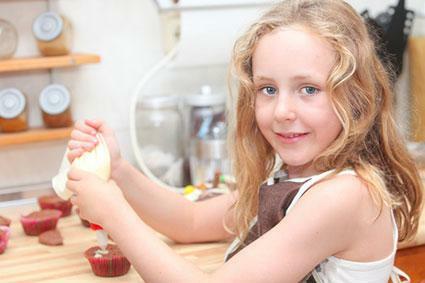 Decorating holiday cupcakes with kids is a fun way to celebrate the season. Any of these Christmas cupcakes will create some cheer this year.